Gem weaving helper. Inspired by GCH. - Shows info on future gem colour and amount of ore in your bags. - Start clicking "Prospecting" button or click "[W]" button (it's above "Prospecting" button) to create and pick up a macro, place this macro on your action bar, start spamming it. Note #1: Macro will work only if addon's UI is visible. Note #2: In general, you DO NOT need to click "Swap Ore" button, it's there for emergency cases. 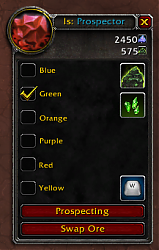 For instance, if you forgot to select needed gem colour, but then saw a chip of said colour drop, you'd need to select that gem colour, click "Swap Ore" button, and then continue spamming either "Prospecting" button or addon's macro. If you found a bug or want to share an idea on how to improve my addon, either report to Issue Tracker on my GitHub page, or post a comment on WoWInterfrace or Curse. Feel free to add and/or review translations on CurseForge, alternatively, you may create a PR on project's GitHub page. Credits go to LuaKTT, the author of Gem Chip Helper.